03.07.2009 The Green Tomato, 100 Western Road, Brighton. The Green Tomato describes itself as a Deli cafe, with a range of fresh made sandwiches, baguettes and wraps to eat in or take away, as well as some delicious sounding and reasonably priced salads and specials- and the Hot Chicken Salad with chicken, mixed leaves, tomato, cucumber, olives and french dressing for £3.95 looked particularly scrumptous. 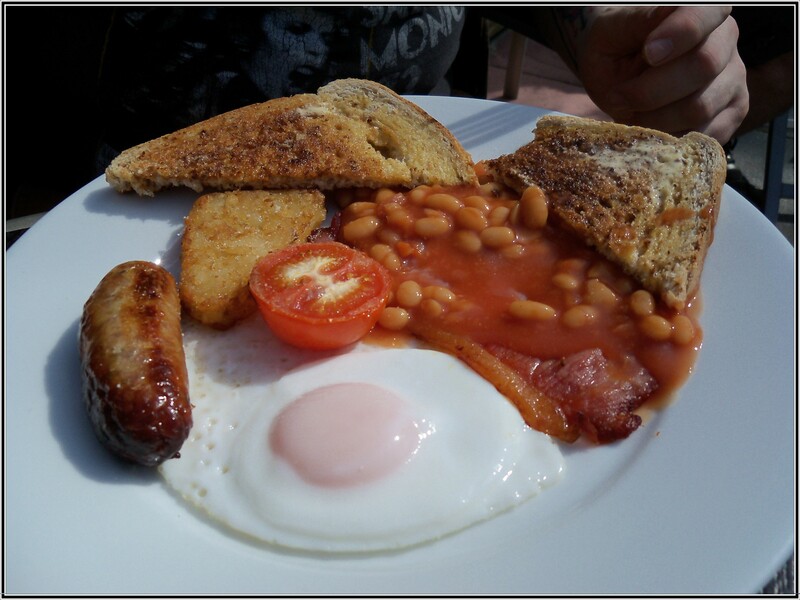 They also serve a range of All Day Breakfasts which of course is why we are here. 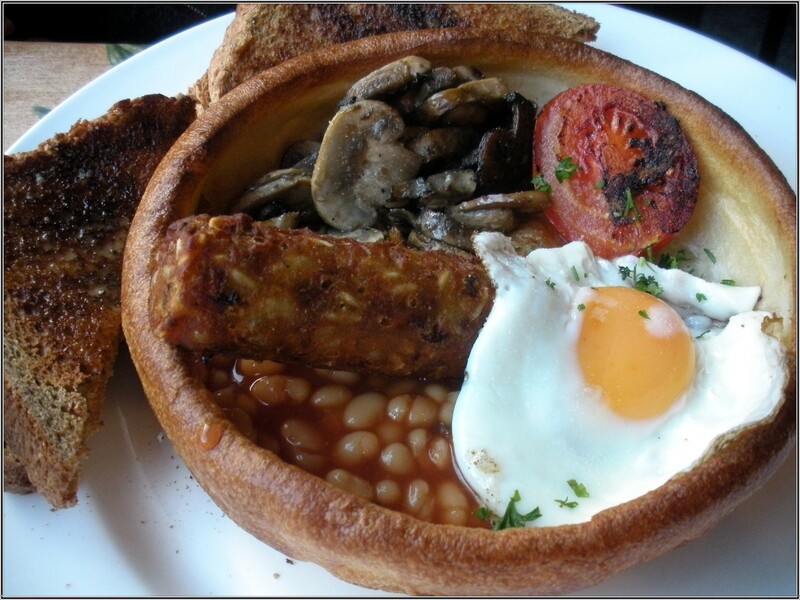 I ordered the Veg (2 sausages, 2 eggs, 2 hash browns, tomato, mushrooms, beans and toast) and D the Big One ( 2 eggs, 2 bacon, sausage, beans, 2 hash browns a choice of tomato or mushrooms and toast) both cost £4.95 and drinks are extra. While waiting for the food we have a chance to check out the interior. The Green Tomato has a fresh contemporary feel with comfy black leatherette seating contrasting nicely with the pastel mauve and mint green walls. Reading material on offer includes a selection of red top tabloids and freebie local magazines and newsletters. Madonna’s greatest hits are playing in the background (Vogue, Justify my Love etc) which is always a good thing in my book. Service is friendly and efficient. Drinks arrive quick and the coffee is delicious and hot – served in a big round mug with extra nooky bonus points awarded for using fairtrade sugar. Breakfast is good too – it’s served piping hot on warmed plates and tastes as good as it looks. Eggs are served sunny side up and the veggie sausages, while not at all sausage like, were particularly nice. D appreciated the hash browns, an unusual addition in most meaty breakfasts, and overall said this was one of his best. Toast was of the thick white doorsteppy variety. As you can see from the photos, portions were good and generous, making this an all round breakfast experience we definitely will be coming back to repeat. 30/05/2009 Pause Cafe, New England Rd, Brighton. Pause specialises in all day breakfasts, hot and cold snacks and tasty lunch time specials – just the place to feed our faces and a welcome oasis of eateries at the end of a busy morning spent shopping along London Road. 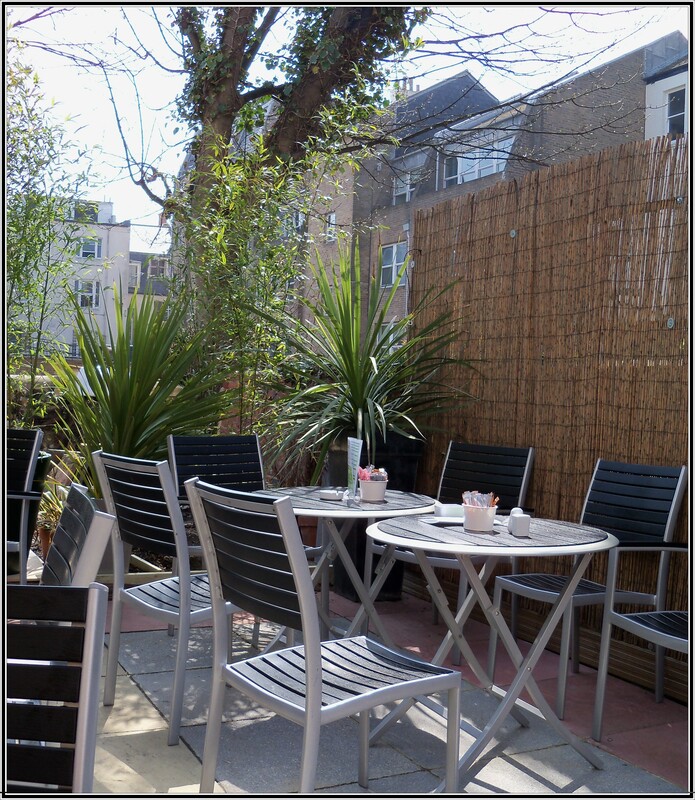 It’s a glorious sunny afternoon and there is plenty of seating outside for those who prefer their breakfasts alfresco. Inside has an upmarket coffee bar feel with free Wi-Fi, modern diner style stools along the walls and big brown leather sofas complementing the bright yellow interior. 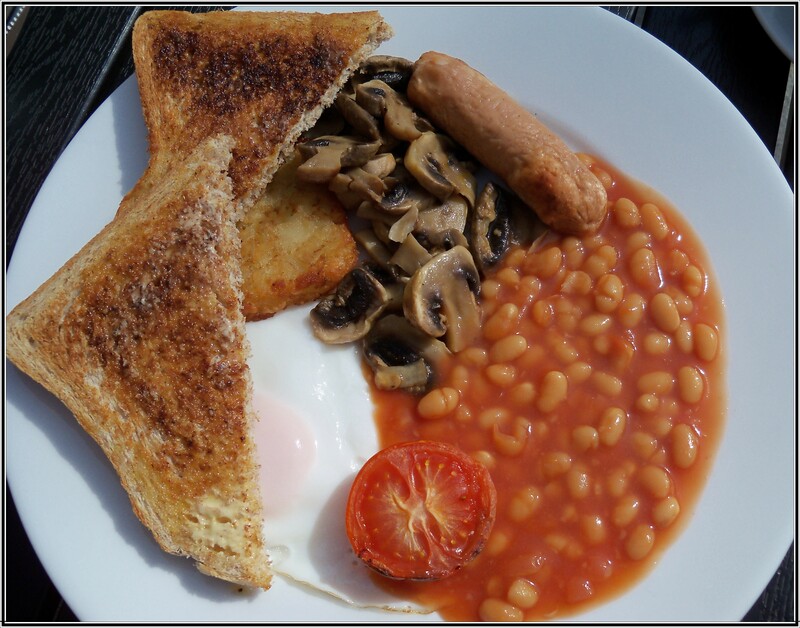 There are a variety of breakfasts to choose from, including Eastern, Continental and an intriguing sounding Ritzy breakfast but I stuck with the good old Veggie – egg, beans, mushrooms, veggie sausage and two slices of toast at £6.95 with a choice of fruit juice and coffee included. Dan had the Traditional; comprising of rasher, egg, sausage, tomato, mushroom and toast- again at £6.95 with tea or coffee and a glass of juice included in the price. If you don’t fancy breakfast there are plenty of wraps, snacks and goodies on offer with a nice choice of herbal teas and healthy options for those of you watching your waistlines. Daily lunch specials include curry, stir fry and Moussaka and on today’s menu was Prawn and avocado wrap with seafood sauce and salad for £5.25 and Spicy lamb kebab wrap with cucumber raita and salad for £5.25. Breakfast soon arrives and is very good. The food was piping hot and eggs were cooked nice and medium. Dan thought his sausages were a little skinny but nicely flavoured all the same as was the bacon, which tasted like it was cooked as you would at home under the grill – nice and pink with a crispy rind . Condiments were top name brands. The fruit juice was a particularly appreciated and with drinks included in the price this made for a very good value breakfast by Brighton standards. Pause describe themselves as stylish and friendly and though this is only our first visit here, we would have to agree. The food’s not half bad either and they also do take away. For more info check out their web page: Pause Cafe. After Breakfast it’s always worth popping across the road to Paul Bruton’s Army Surplus store – a cornucopia of everything Army and Navy. Today’s bargain buy- a pair of industrial (and no doubt acid resistant) rubber gloves for only 50p. 28.03.2009 Rock Ola Cafe, Tidy Street, Brighton. This is our third visit to this café in the last year and it never disappoints. 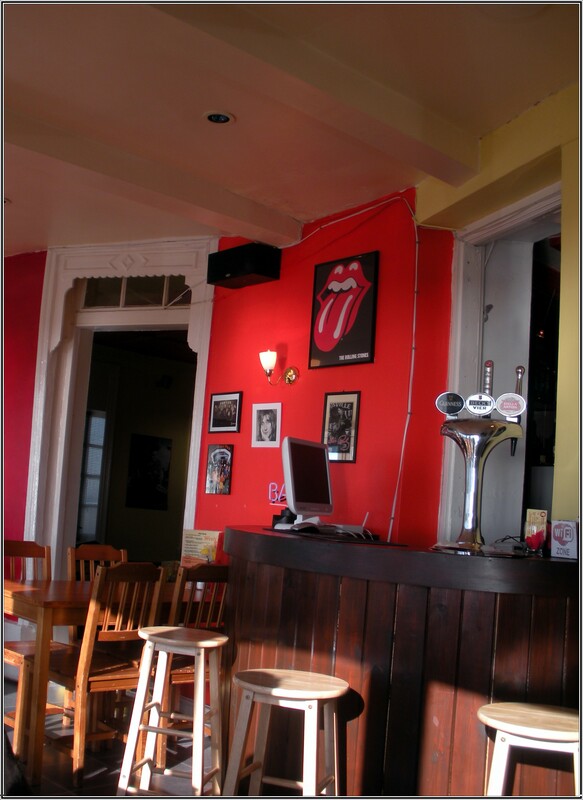 The Rock Ola café is a family run affair tucked away on Tidy street , just round the back of the North Laines . As you’d expect from the name, there is a distinct 50’s flair to the interior; from the retro ‘Diner Style’ Formica tables with pastel pink and blue leatherette stools to the beautiful old juke box that still works and is free to use. The brightly painted walls are a treasure trove of Rock’n’Roll memorabilia and assorted oddments, including a framed screengrab of PJ Proby and a signed Kate Bush album, rather incongruously positioned on a wall covered by Beatle portraits and a Sergeant Pepper poster; though on reflection the thematic mismatch of Bush and Celine Dion, mixed in with Buddy Holly and Elvis, makes the place more genuine than most 50’s diners you get. I ordered the Vegetarian Breakfast, an all day affair comprising of egg, veggie burger (or veggie bacon) hash browns (or fries) tomato (or beans) sausage and toast, at £4.95. D had the All Day American; a transatlantic combination of sweet and savoury with 2x egg, 2x bacon, sausage, 2 pattie burgers, tomato and buttermilk pancakes with maple syrup, all for £5.95. We also opted for an extra side order of cheesy chips. Service is friendly and though the food takes a little while to show, it’s good to know it’s freshly cooked. Breakfast looks good, perfectly presented on multi-coloured plates; piping hot and delicious. The hash browns let the side down a bit, as they obviously came out of a packet but they tasted ok and the eggs were cooked perfect. Toast was just how I like it; chunky, white and dripping in butter.The cheesy chips were a treat too. Thick and hot and smothered in luscious dripping cheddar. As well as Breakfasts served all day, including a Vegan option, Rock Ola offers a variety of sandwiches, sweets and lunchtime treats. Specials today were Soup of the Day with bread and butter for £3.50 and Chicken casserole with potatoes and veg for £5.95. Drinks are all the usual, including a yummy range of milk shakes and the special homemade pink lemonade, which is delicious. There is constant supply of some great rock and roll adding to the ambience. One other cool thing about this place is you don’t even need to leave to get to the best of Brighton’s record / book stores, as there’s a doorway, aptly called Rock ‘n’ Roll Alley, to the left of the seating area, that leads you straight to The Singles Bar and on into Wax Factor. This ones going to be short and savoury as I am rather tardily writing this a few weeks after the event. 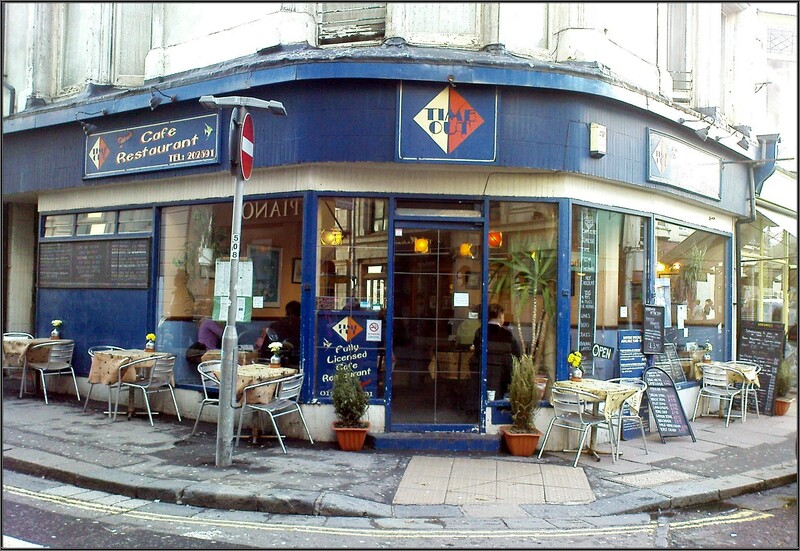 Figaro’s is a straight out of the 70’s ‘caff’ in kemp town we have frequented many times over the years. Tucked away on Georges street, this is a rather attractive looking eatery with a charming bay windowed frontage; inside is cosy and homely with plenty of seating, including sofas and armchairs for extra relaxation as well as additional seating along the main window if you fancy watching the world go by as you eat. There are some newspapers available for the more literary inclined; though when we visited last weeks metro was the most high brow tabloid available. There is one toilet through a beaded curtain, which has certainly seen more beaded days, but the toilet itself is clean, functional and with a working lock. Today we were joined by Lee, friend of Thee Nook and fellow food critic extraordinaire. We were all feeling a little fragile from the night before so two of us opted for the smaller breakfasts, which are great value for £3 – £3.50, with bread slice or toast, while Dan chose the omelette. 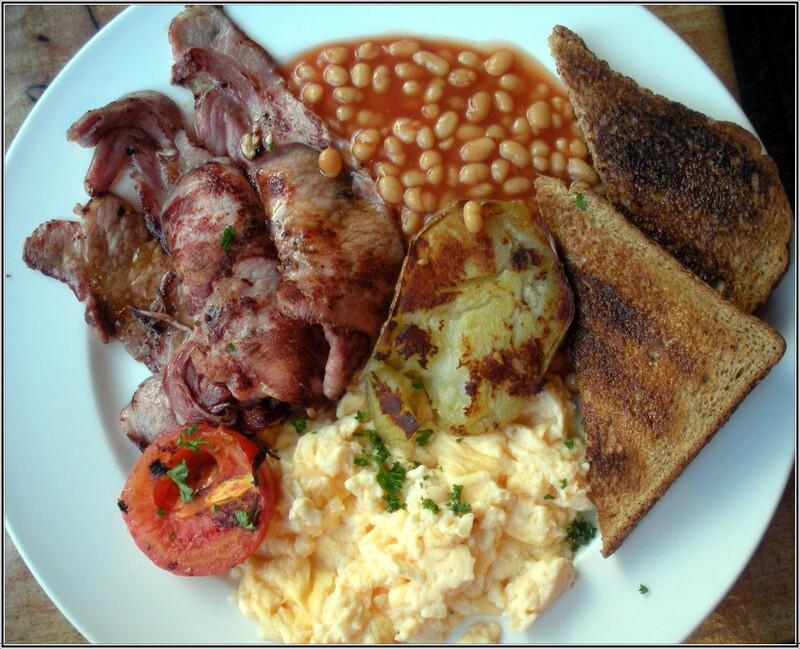 There are plenty of bigger breakfasts on offer as well as a range of other cafe type fare such as jacket potatoes and roast dinners. Coffee and tea costs extra but are reasonably priced and the coffee is delicious. Breakfast arrived on bright blue china that blended beautifully with the orange tablecloths. The food itself was not the most attractive looking of fare but we weren’t there to stare and it tasted just dandy- though we had to wait a bit for the omelette. Lee gave his a 9/10, and mine wasn’t half bad either. We all thought the omelette looked worth the wait and Dan confirmed it tasted pretty good too. Condiments on offer were Lidl ketchup, brown sauce, and salad cream – cheap but adequate none the less, providing just the right balance of flavour to an excellent budget breakfast. It’s been pouring with rain all morning and the only thing that’s going to get us out the house today is the promise of a juicy, fat fry up. Buried within the backstreets behind the west pier, on the corner of Montpelier rd and Sillwood st, Belchers looks exactly the kind of café that delivers on its promises. As we approach a welcoming glow greets us through the net curtained, steamed up windows and inside is warm and welcoming. There is a good selection of breakfasts on offer. We place our orders at the counter and make our way to the table by the window. 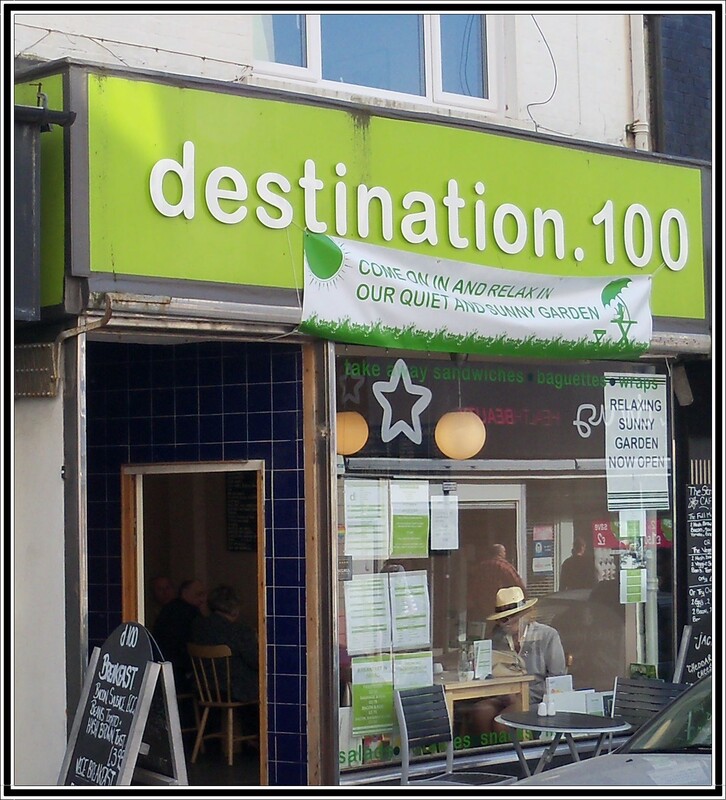 The décor is tradition café style with wood panelled walls, lino floor, menus on the walls and a community notice board. A lady bird theme brightens the tone with a cute lady bug wind chime on the door matching the brightly coloured plastic table covers. A table in the corner brims with local papers and information as well as a pile of thriller / horror books – just the right reading for a leisurely breakfast. I ordered the Veggie breakfast with 1 fried egg, 2 veggie sausages, beans, tomato and fried slice. This costs £4 and coffee and a slice of bread and butter is included in the price. 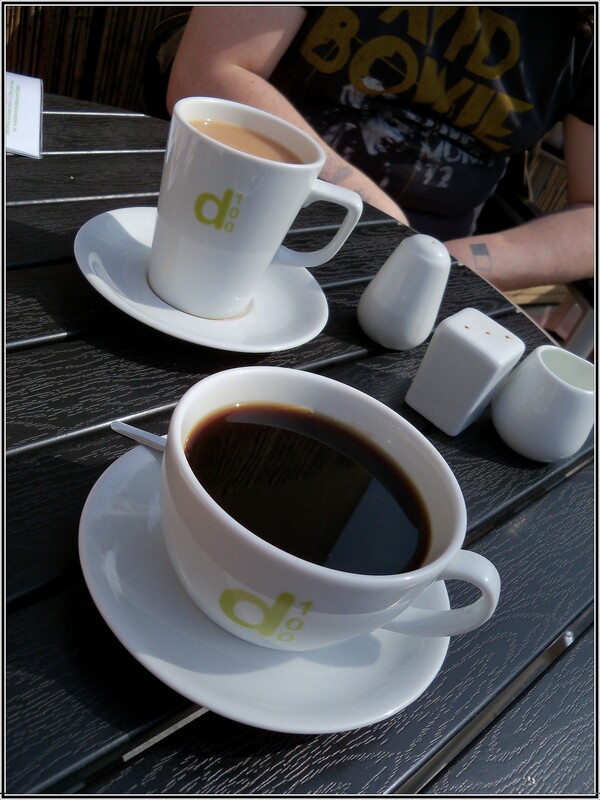 D had the Big Breakfast. This costs £6.25 and comprises of 2 fried eggs, 2 sausages, beans, bacon, tomato, chips, fried slice, bread and butter and a mug of tea or coffee. Breakfast arrived quick and was just what we had hoped for. The food was all good quality with generous portions. The tomatoes were freshly grilled not tinned and the eggs were cooked just right, not too over done and just runny enough. The Big Breakfast was huge and everything seemed buried under a mound of chips, which was a good thing as they tasted delicious. D had been looking forward to the £4 breakfast and had felt a bit hard done by on noticing the Big breakfast included chips on the board. Risking getting less of all on the plate he went for it and says it was the sort of thing you wouldn’t have thought about raising an eyebrow over if it had been billed the £8 mega-pig-buster or somesuch. Sauces were top brands- Heinz and hp. The coffee was strong and served in a mug, as was the tea. There was no background music and the café was quiet, making breakfast a refreshingly restful affair as all we could hear was the rain pouring down outside. Not the prettiest named cafe in town but we will definitely be coming back for more. We’ve been here a fair few times and have never been disappointed. Today I had the all day veggie breakfast comprising of scrambled egg (from a choice of 2 fried eggs or scrambled), 2 veggie sausages, mushrooms, hash browns (from a choice of hash browns or fries) and grilled tomatoes (instead of beans). 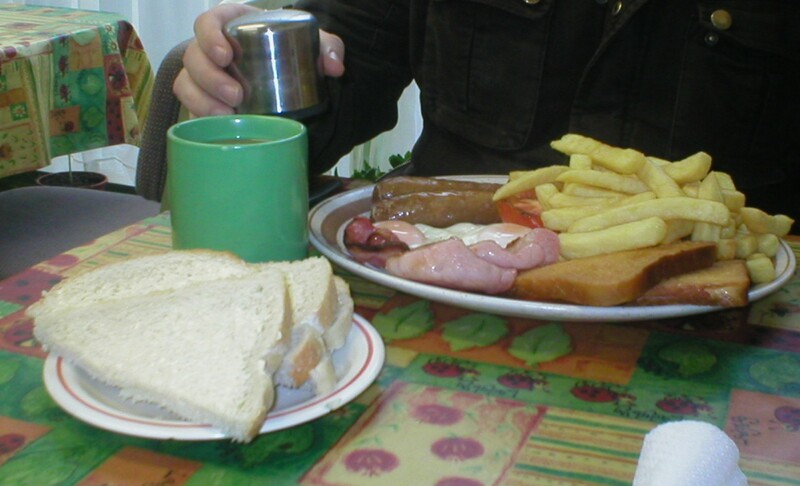 This was served with two slices of buttered toast and a coffee at a cost of £6.95. The coffee comes in a small mug, without refill, and is hot, fresh and filtered. The breakfast was very good, especially the eggs, with good size portions. I wasn’t too keen on the veggie sausages as I personally prefer my veggie sausages to at least make some attempt at pretending to be meat whereas these were something else entirely – they reminded me of the potato bakes we used to buy at Somerfields but the Other Half loved them. (He had the cheese omelette with fries and a cup of tea for £6.75 and says the chips were nice, fat and golden tasting and the omelette was cooked just right. He was however enviously eyeing someone else’s Full English breakfast with chips, which may be the way to go for meat eaters). 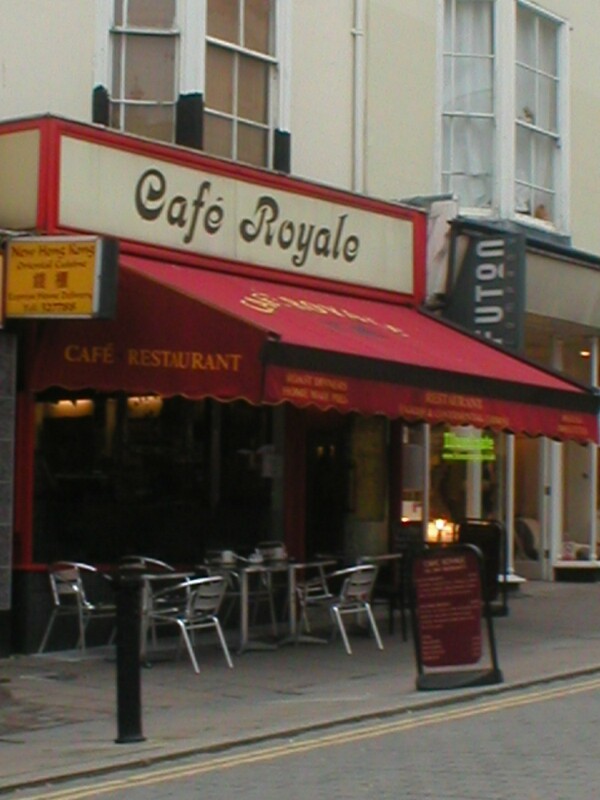 The service was friendly, but a little slow, though the place was busy as it was Saturday lunchtime. The music was muted, we could just make out Spandau Ballet’s ‘True’ playing in the background and there are toilets. We both like the décor; an assortment of tiffany lighting, random nic nacs and paintings mixed together with a touch of regency styling. I had a statue of a waiter in front of me and his foot in front of my mouth and I felt like I ought to kiss his little stone shoes as a sort of thank you every now and then. Overall a rather convivial, if a tad expensive, breakfast- though since there is also a bar and lots of other meals on offer this remains a popular venue for tourists and shoppers alike.